Alligators are large reptiles with appetites to match. These scaly beasts are often found in or near water where they wait to ambush unsuspecting prey. Alligators have extremely powerful jaws which they use to submerge their prey underwater. Gators are typically found in marshes and swamps or in the jungles along the banks of rivers. Being very territorial, an alligator is very likely to attack anyone unfortunate enough to find themselves near their nesting grounds; however, they are also fairly slow animals and can be easily outrun by all but the most ungainly. Alligators are hunted for their skin and meat; their spiny hide is coveted by leather workers for it's use in armor. Their meat is a staple food for those living near swamps where other meat sources may not be as abundant. It should also be said that these beasts have been tamed and trained by those with moderate skill animal taming. 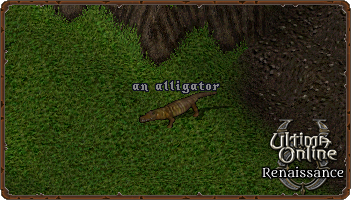 Additionally, the zookeeper at the Moonglow Zoo is looking for a particularly rare breed of alligator called 'a crocodile' to add to his collection. One should look to find it among other alligators.